Thermoplastics and Thermoplastic Composites, Third Edition bridges the technology and business aspects of thermoplastics, providing a guide designed to help engineers working in real-world industrial settings. The author explores the criteria for material selection, provides a detailed guide to each family of thermoplastics, and explains the various processing options for each material type. 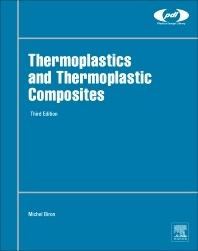 More than 30 families of thermoplastics are described with information on their advantages and drawbacks, special grades, prices, transformation processes, applications, thermal behavior, technological properties (tenacity, friction, dimensional stability), durability (ageing, creep, fatigue), chemical and fire behavior, electrical properties, and joining possibilities. In this third edition, standards and costs have been updated for all materials, and more information on topics such as bioplastics, 3D printing and recycling have been added. In addition, an entirely new chapter on the concept of ‘Industry 4.0’ has been added, with guidance and suggestions on the incorporation of virtualization, connectivity, and automation into the plastics engineering process to reduce materials and processing failure.